Why is HostGator one of the Best Web Hosting? HostGator is one of the best web hosting company which is providing 99.99.% Server Uptime, average cost plans, and best customer support. It's one of the oldest web hosting company that is the biggest reason for trust. Today I’m going to share my experience with HostGator by writing this detailed HostGator Review. To start a website or blog we need a hosting which helps us in saving hard-earned money and ranking in search engines too. There are many web hosting providers, but we need the best one because if your hosting plan is good, then it will help us in getting as much as a better result. There are many hosting companies out there in the online industry, but all are not as we want. Some are good but very costly which a newbie can not afford. But, when I think about best hosting providers, then BlueHost, Hostgator, and Namecheap is my first choice which I would like to use. These hosting providers (Hostgator, Bluehost, and Namecheap) are one of the best companies which are helping the new generation to start their online careers. HostGator is providing this all stuff already. Writing a Hostgator Review does not mean I only want to earn money, but I also want to provide information about this hosting company to my all readers who are willing to buy a new hosting plan. Without boring you, Let’s start introduction of this hosting company. From where it’s started, how it became a most recommended hosting provider, what are the Pros and Cons of it, etc. In 2002, HostGator was founded by Brent Oxley when he was in his college. When he started it, he was single, but he never thought that in future, this company would get thousands of employees. The company is also listed as a top most growing company in 2008 and 2009. In 2008 it was ranked 21st, and in 2009, It was ranked 239th position. In 2012, Brent sold the company to Endurance International Group (EIG) for $225 million which is unbelievable. EIG is not an average company because it’s also own many other biggest hosting companies like BlueHost, iPage, FatCow, HostMonster, Easy CGI, eHost, A Small Orange, and so on. So, we can say without any doubt that EIG is one of the world’s biggest hosting company. I’m using Hostgator on my other sites from last two years, and that’s why I came up with this HostGator Review post. As the HostGator company is getting old, its customers are increasing. Always keep in mind that the clients of any business do not grow inexplicably. Of course, the company is providing excellent services to its customers; its customers are increasing day by day. Let’s start reviewing HostGator below. I will share all that I experienced with HostGator along with its cost pricing and other necessary details. Hostgator is from the last 15 years in the online field and offering top class services to their customers from the first day. They are offering, Hosting and Domains services to Pro Bloggers, Entrepreneurs, and newbies who are seeking to start a weblog to be famous and to make money online. So, Here are few features which are Hostgator is providing to their users like as; fast app installer, powerful Cpanel, SSL certificates, solid customer support, programming & databases. Quick App Installer – You can install your blog on any platform you would like to host. It takes only a few seconds. You only need to fill necessary details and only one tap. Powerful Cpanel – It is also providing a powerful Cpanel to their customers as well. Cpanel comes with all necessary goodies which help us to make a successful website. SSL Certificates – SSL is now a ranking factor, and Google officially announces it. If you want to buy an SSL certificate, then HostGator is also providing it. SSL certificates can be very helpful regarding rankings. Solid Customer Support – To resolve issues of customers, they are providing solid customer support to their clients. You can ask your queries by live chat, phone call, and by email chat. Programming and Databases – They are also providing PHP, MySQL, SSH access and much more languages to the advanced users as well. As you, all know that I’m working online since 2-3 years & I’ve used many hosting providers on my other sites, but HostGator is on my favorite list. I’ve used Siteground, Namecheap, Godaddy, Bluehost, and many others too. But, If you ask me which are best, then I’ll recommend you HostGator, BlueHost, NameCheap, and SiteGround. Most of us know that Hostgator is not a new name. It’s one of the trusted hosting providers which is working from last 15+ years to help people like you and me. And, this is the reason why I wrote this HostGator review, and now I’m recommending my all readers to buy hosting from them. There are many Pros of Hostgator that can prove easily why it is one of the best web hosting companies. Same like as BlueHost, HostGator is one of the oldest and one of the best hosting provider. HostGator became best, and yes it is due to its features and pros. There are many profits of using HostGator like as; better customer support, average prices, etc. Below, I wrote a quick summary about Pros of using HostGator web hosting. We all want better customer support it does not matter we are buying hosting or anything else. Better customer support is the first thing which a customer want. So, if you want to know about its customer support then don’t worry and buy hosting from them without thinking much. HostGator is providing a decent customer support to their users. HostGator is providing 24×7 customer support to their valuable users like you by live chat, through email, and via phone call. The client’s representative, who will talk or chat with you will be very helpful and kind in nature. Not only good in quality but also all customer representatives are very knowledgeable and experienced too. When you need any help, then you can realize how friendly Hostgator’s representatives are. You can not hear anything wrong words from them. You can also call them for a quick support and they will help you out of sure. I’m damn sure, after using Hostgator’s service, your mind will be blown away. The major thing which a client want is server uptime because if site server is up and the site is running without issue, then it is useful otherwise it is worthless. I asked many HostGator web hosting users about its server uptime, and they all are entirely satisfied due to its 99.99% server uptime feature. According to the many surveys, HostGator is claiming that their servers are 99.99% uptime and I also realize that from last one year because my site never went down. Hostgator is providing world’s best technology regarding servers and even though they’re upgrading their technology day after day. The server uptime they are providing is just outstanding and unbelievable. So, don’t worry about server uptime issue and if you’re looking for a best WordPress web hosting which is providing better uptime server then go with Hostgator. I’m writing this Hostgator Review is to provide complete information about it, and It’s my duty to tell you each and everything about it. If you’re very new to the online field and looking for a web hosting which you can use without confusion, then HostGator should be your first choice. With detailed explanations and simple step-by-step walk-throughs, they also have endless tutorials, FAQ pages and documents to help you at every point wherever you want it. Free Migration – Here free migration means Hostgator will happily assist you in migrating your existing website to their service which will be free of cost. Robust Security Features – If you’re thinking about starting a website and looking for a web hosting provider, but worried about security, then HostGator is the best choice for you. You’ll also enjoy a free SSL certificate, automatic daily database backups, and automatic malware removal. I hope these are the best and robust security features which a customer want from the web hosting company. This one is best for clients. Mostly all other web hosting companies are providing 30 days money back guarantee to their customers, but HostGator is number one because it is offering 45 days of money-back guarantee. So, Hostgator is always be 15 days of the extra period for testing their services, and if you’re unsatisfied, then they will refund you. I think this period is enough to test services and to make up your mind and commit to a package. I think if you was worried about any money back issue, then you have to get your answer. As you all know that, nothing is perfect in this world. And just like that, no web hosting is 100% perfect. 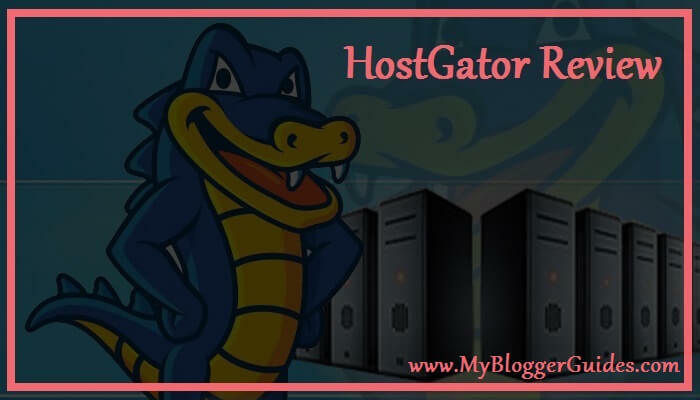 Writing HostGator Review means I’ve to tell you everything about it and that’s why, Below, I’ve discussed few cons of HostGator that I don’t like. Some web hosting plans of HostGator are expensive compared to other hosting providers. They are charging little extra cost in same plans which other hosting providers are offering at less price. The lowest cost of shared hosting is two dollars and the same hosting plan you can buy from other web hosting in less than the HostGator. Thankfully, some other hosting plans are less expensive than other web hosting providers, which are the best at all compared to others. All other top web hosting providers are offering a free domain to customers at the same price. But HostGator does not give this offer to their clients. So, if you are looking for a free domain with hosting plan then sorry because the HostGator web hosting is not providing it. The only thing you can do here, Purchase a new domain or buy hosting from Bluehost like web hosting companies. If you want to buy a long-term web hosting plan because of less cost or any discount, then please keep in mind that HostGator is not offering any discount offer to long term clients. However, other web hosting providers are offering discount offer to long-term web hosting clients. But as I already told you above nothing is perfect so don’t expect it from Hostgator. The Hostgator is far behind in these discount terms. Also Check – Hostgator Discount Up To 60%. Let’s have a look at different plans of Hostgator along with its cost pricing details. And select a hosting plan that you can pay for. So, the most recommended and popular hosting plan of HostGator is shared hosting because it’s not expensive compared to other programs. But, I’ll tell you all plans with their cost pricing details so don’t worry about anything. Just scroll down the page and read all HostGator web hosting plans. Shared Hosting plan is the least web hosting plan by HostGator. The Shared hosting is one of the popular web-hostings which everyone is recommending to their readers and me too. The shared hosting plan comes with three different plans; Hatchling, Baby, and Business, so that it can be fit as per needs of webmasters. If you want to start a new website, then it is the best plan for you. You can select any one of the plans as your requirements. Hatching Plan – This plan starts from $3.95/month. In this scheme, you can host single domain and unmetered BandWidth. Baby Plan – This plan is best among all, and all professional bloggers are recommending it. The plan starts from $5.95/Month. You can host unlimited domains using this hosting plan of HostGator, and unmetered BandWidth is also provided. Business Plan – The price is same as baby plan; $5.95 per month on 20-03-2017. The name of this web hosting plan is describing itself about it. You can use this plan if you own a business or have a website with a huge number of daily visits. On this plan, you can host unlimited domains with unmetered bandwidth and unlimited disk space. People, who are looking for web hosting to host their blogs on WordPress content management system (CMS), then this Managed WordPress Hosting of Hostgator is one of the best choices. There are plenty of options available in this web hosting plan which you can not find on other hosting plans. So, the hosting name is describing itself about it, so I think there is no need to a should have to tell you about its plans and cost pricing details. Managed WordPress Hosting of Hostgator comes with three plans; Starter, Standard, and Business plan. Let’s have a look on it cost pricing details. Starter Plan – $5.95/Month. You can host one website on this hosting plan. This plan is for those who want to start a small internet site. You’ll get 50 GB storage with 1GB Backups. It can easily handle those blogs who are getting around 25k visits per month. Standard Plan – $7.95/Month. 2 websites you can host on this hosting plan. This plan is for those who want to start a normal internet site. You’ll get 150 GB storage with 2GB Backups. It can easily handle those blogs who are getting around 200k visits per month. Business Plan – $9.95/Month. Three websites you can host on this hosting plan. This plan is for those who want to start a big network website. You’ll get unlimited storage with 3GB Backups. It can easily handle those blogs who are getting around 300k visits per month. Cloud Hosting is mainly dedicated to the users who want to host their blogs on WordPress. This one is new, faster and more scalable hosting plan; many bloggers are saying this is future of hosting providers. All of the HostGator’s plans are coming with unlimited disk space and unmetered bandwidth. Just like as shared web hosting, Cloud Hosting also came up with three different plans; Hatching, Baby, and Business plan. Hatching Cloud Plan – This plan starts from $4.95/month. In this scheme, you can host a single domain, and it comes with 2GB Memory and 2 Cor CPU. Baby Cloud Plan – This plan is best among all, and all professional bloggers are recommending it. The plan starts from $7.95/Month. You can host unlimited domains using this hosting plan of HostGator, and unmetered BandWidth, 4GB Memory, 4 Core CPU is also provided. Business Cloud Plan – The price is same as baby plan; $9.95 per month on 20-03-2017. The name of this web hosting plan is describing itself about it. You can use this plan if you own a business or have a website with a huge number of daily visits. On this scheme, you can host unlimited domains with unmetered bandwidth, Private SSL, IP, 6GB Memory, 6 Core CPU, and unlimited disk space. Dedicated Hosting is one of the most expensive hosting plans of HostGator. This hosting plan is especially for yourself that’s why it is costly. But as much as it is expensive, it is also good same as Bluehost and SiteGround. You’ll get, a physical server which will be all yours. This hosting plan is especially for business purposes like you can offer your hosting to your employees or customers who are operating small websites. So, if you want to do business, then it is the best plan for you. 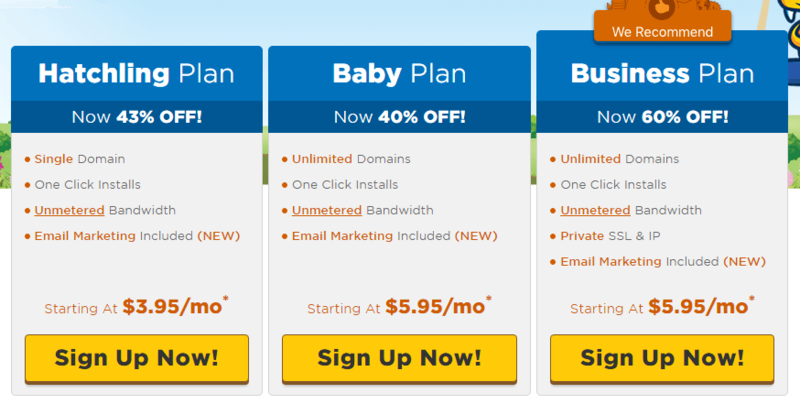 So, this hosting plan comes with four different plans; Basic, Standard, Elite, and Pro. You can choose from Windows or Linux environment; Either way, you will pay the same initial rate. It is terrible because many hosts will charge additional fees if you want to use a Windows hosting plan. Have a look at its price details which is given below. Basic Plan – $79.00/Month. 0.5 TB Disk (RAID), 4GB RAM, 10TB BandWidth, 2 Core CPU. Standard Plan – $89.00/Month. 1TB Disk (RAID), 4GB RAM, 15TB BandWidth, 4 Core CPU. Elite Plan – $109.00/Month. 1TB Disk (RAID), 8GB RAM, 20TB BandWidth, 4 Core CPU. Pro Plan – $128.99/Month. 1TB Disk (RAID), 16GB RAM, 25TB BandWidth, 4 Core CPU. If my readers, who are seeking to buy VPS hosting from HostGator, then I would like to tell you that there are three different plans. So, Hostgator is offering three programs; Snappy 2000, Snappy 4000, and Snappy 8000. It is less expensive than numerous competing plans done by various web hosts and expresses a great deal. The significant fact of VPS Hosting plan of Hostgator which attract people towards it and it has three different plans. It means People who don’t have enough budget to buy VPS hosting can also purchase from HostGator. It means Hostgator’s VPS hostings are more flexible regarding cost and pricing. So, anyone can buy without any problem. Cost pricing details of these three different hosting plans are given below. Snappy 2000 – The lowest VPS Hosting plan of Hostgator is Snappy 2000. It comes with 2 GB RAM, 2 Cores CPU, 120 GB Disk Space, and 1.5 TB Bandwidth. 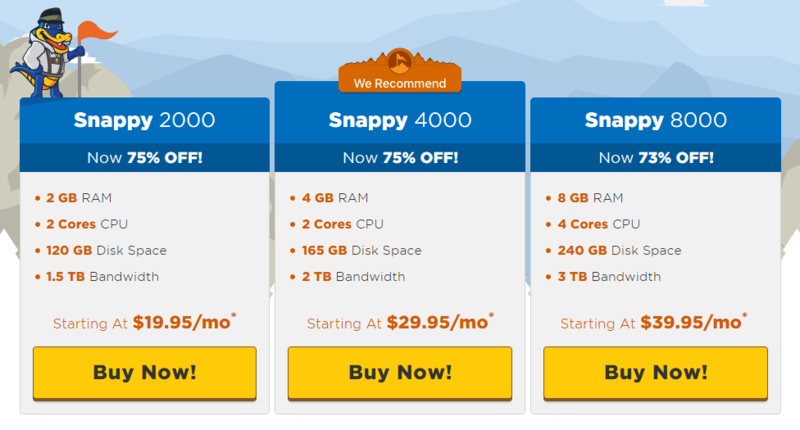 Snappy 4000 – It is the standard plan of Hostgator’s VPS Hosting which includes 4 GB RAM, 2 Cores CPU, 165 GB Disk Space, and 2 TB Bandwidth. Snappy 8000 – This one is the highest plan of Hostgator’s VPS hosting. It includes 8 GB RAM, 4 Cores CPU, 240 GB Disk Space, and 3 TB Bandwidth. If you’re running web development agency to build up sites for your clients, then reseller hosting is one of the best choices for you. So, Hostgator is offering reseller web hosting which is perfect for web development agency owners. Reseller web hosting of Hostgator comes with three different plans such as Aluminium, Copper, and Silver. Price details of this hosting plan are given below, scroll down and have a look at it if you want to buy it. Aluminum – Starting at $19.95/Month. 60 GB Disk, 600 GB Bandwidth, and Unlimited Domains. Copper – Starting at $24.95/Month. 90 GB Disk, 900 GB Bandwidth, and Unlimited Domains. Silver – Starting at $24.95/Month. 140 GB Disk, 1400 GB Bandwidth, and Unlimited Domains. Here’s the quick summary of Hostgator Review. I wrote this Hostgator review article with the hope to provide all information that you should know. So, Let’s read all information about it which is given below. Security – Websites, which are hosted by Hostgator are protected with a customized firewall. So, if you’re a Hostgator user, then your site is safe from DDoS attacks. There are many other options available for Hostgator users by using them you can easily secure your site from harmful malware. Cost Pricing – Cost pricing are little expensive of some hosting plans, but thankfully, the price of some other hosting plans are very less compared to other companies. Customer Support – Customer support is very best compared to others. You can get any type of help regarding your hosting from them. They are offering live chat support, email, and also you can call them for a quick solution. 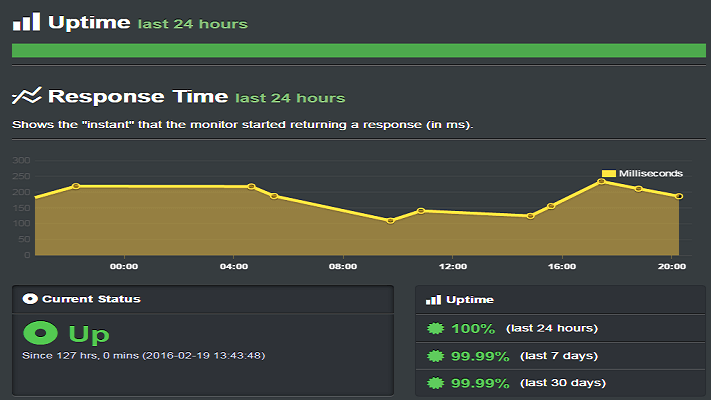 Server Uptime – According to many tests, HostGator comes with 99.99% uptime server. So, your site will always be up, and I hope you’ll never face any issue of the site down. Hosting Plans – There are plenty of hosting plans available there in Hostgator. You can select as per your pocket and needs. No need to waste your money in buying costly web hosting from other web hosting providers. Money Back Guarantee – HostGator is offering 45 days of 100% money back guarantee to their clients. It’s enough time to check hosting features. Ease-Of-Use – Hostgator comes with free website building tools including Weebly SiteBuilder. There are many apps and script functions available by using which you can install any CMS with a single click. cPanel – Many apps and services available. The dashboard experience is excellent just because of the Contol Panel. Additional Bonuses – For shared hosting services users, Hostgator is offering a $100 Adwords credit, and For those who are reseller users, they are given a free upgrade to an eNom domain reseller account. One-Click-Installation – You can easily install any CMSs you want to install like WordPress, Joomla, etc. It will take few steps and time. Payment Methods – You can pay using Paypal and Credit Card. Account Activation – It can take up to 24 – 48 hours to fully activate your account. So, above I tried my best to write HostGator Review. In this HostGator Review, I’ve tried my best to provide you complete information about it, and I hope you liked this article. If anyhow you find any mistake in above review of HostGator, then I’m feeling sorry. First of all, I think this Review has already become one of the best and most informative HostGator Review which are available on the internet. To buy best web hosting, we asked many of fellow bloggers & friends so that we can buy the best hosting for our blog. I spend two to three days in researching and writing this HostGator web hosting Review that’s why it became lengthy and informative. So, While writing this Hostgator Review, the first thing that I concluded is that they have a lot of hosting plans which are best for people who don’t have enough budget because they can buy any hosting as per their pockets and needs. Overall, It’s good to start a blog with a branded and trustable hosting provider same like as Bluehost because you’ll never face any problem and if faced then you’ll get a solution very quickly. So, I hope this HostGator Review will help you in understanding why it is the best web hosting and why you should go with it. Please do share your views using below comment box and don’t forget to share this article with your friends on your social networking profiles. Stay Blessed & Stay Happy.